[11:40:14 AM] TEAM SKILLING: Hey! [11:40:20 AM] TEAM SKILLING: You the guy about PLAT ? [11:42:33 AM] Harbringer1992: anyways what does the account have on it? [11:42:49 AM] Harbringer1992: rune pages? [11:43:41 AM] Harbringer1992: ask price for it? [11:45:39 AM] TEAM SKILLING: Offer. [11:48:51 AM] TEAM SKILLING: Heh alright. [11:49:21 AM] TEAM SKILLING: So whats the final pricfe? [11:51:53 AM] Harbringer1992: do you have your own shop page? [11:52:03 AM] Harbringer1992: as a post in the selling areas? [11:54:54 AM] TEAM SKILLING: why? [11:56:10 AM] Harbringer1992: ight so you like paypal? [11:56:20 AM] TEAM SKILLING: Yep. [11:56:29 AM] TEAM SKILLING: Or you got anything else? [11:56:31 AM] Harbringer1992: and how do i receive my account? [11:57:41 AM] Harbringer1992: where do i send money to? [11:58:09 AM] TEAM SKILLING: Dont ask. [11:58:19 AM] Harbringer1992: once all complete and i change account information if all looks well ill bouch for u on site. I'm in with devs as well. 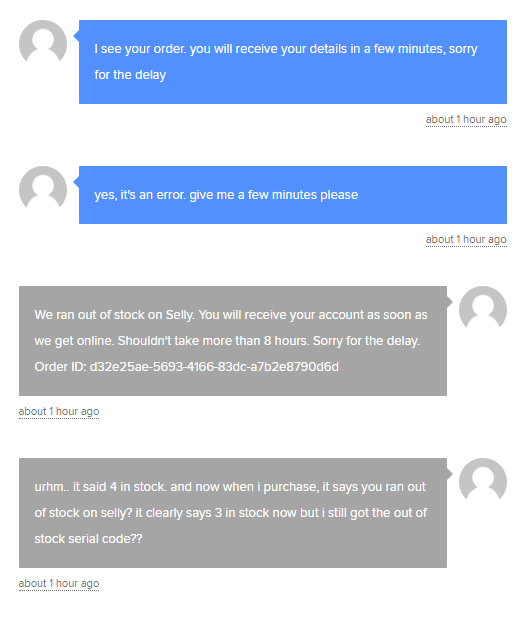 [11:59:55 AM] TEAM SKILLING: Ohh btw, F&F method to avoid chargebacks, had couple of issues here with buyers. [12:00:19 PM] TEAM SKILLING: Euros yes. [12:00:40 PM] Harbringer1992: would u like it to be the 100 euros or is this fine? [12:02:25 PM] TEAM SKILLING: As i said, i cant accept other methdos, then GIFT, i already had 3 issues with buyers who charged back. [12:03:32 PM] TEAM SKILLING: Alright. [12:06:06 PM] Harbringer1992: okay account info? [12:08:06 PM] Harbringer1992: Your recipient should have the money by June 2, 2017. [12:09:46 PM] Harbringer1992: if the balance doesn't show till june 2? [12:13:15 PM] Harbringer1992: Starting to worry me here of a possible scam. i know tosh vouched and all but there was some people that said scam. THIS IS WHERE HE WENT OFFLINE. Description/Elaboration : I made a post http://gamingonstero...ked-na-account/ and he responded. Checked and tosh did vouch so thought it was safe? yea he dipped on me as soon as he got the money, learned my listen to never buy from this community again. 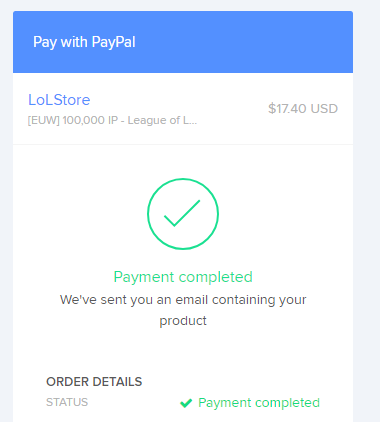 Reason For Reporting :never received account that i bought. He received payment, responded to me saying it'll be a few mins, now it's been over an hour. from 17:40, now it's 19:27.